With the world’s press spending a great deal of its energy on the rather fractious relationship between the United States and North Korea, a look back in time gives us some fascinating insight regarding the geopolitical stresses that rule the region, particularly the stresses that occurred during the Korean War. 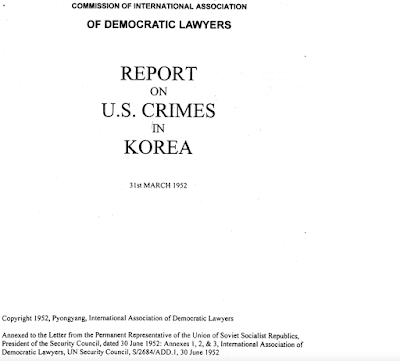 Thanks to the International Action Center and the International Association of Democratic Lawyers (IADL), a Non-Governmental Organization which was founded in 1946 and acts as a consultative group to UNESCO, we have an interesting document that outlines some of America’s actions on the Korean Peninsula during the early 1950s. 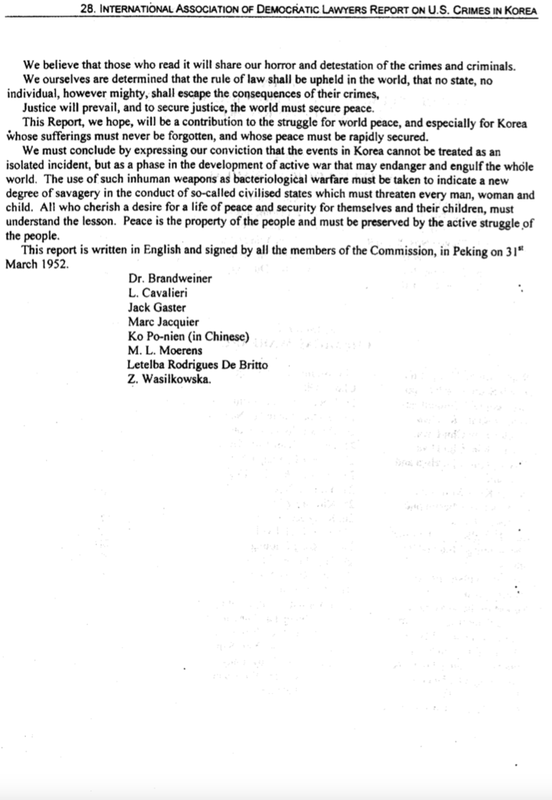 The IADL notes that, under United Nations rules, the U.S. intervention on the Korean Peninsula was unlawful and that President Truman’s orders to the American Navy and Air Force should be considered an “aggressive act” that went against the United Nations Charter. In addition, a great quantity of fish of a species which live in regions between fresh water and salt water were found; these fish were found in a half rotten state and were infected with cholera. 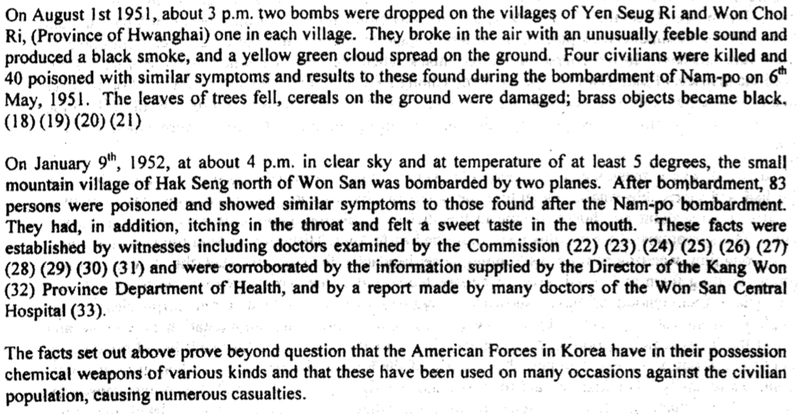 In the first attack on Nampo City, there were 1,379 casualties of which 480 died of suffocation and 647 others were affected by gas. 3.) Mass Massacres: According to witnesses, the commander of the U.S. 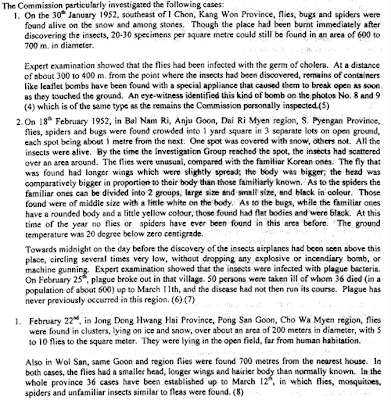 Forces in the region of Sinchon by the name of Harrison ordered the mass killing of 35,383 civilians (19,149 men and 16,234 women) during the period between October 17th and December 7th, 1950. 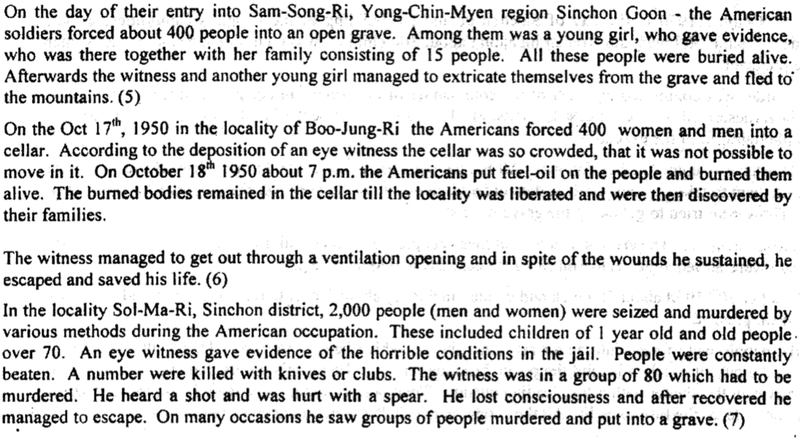 The civilians were pushed into a deep open grave, doused with fuel oil and set on fire. Those who tried to escape were shot. 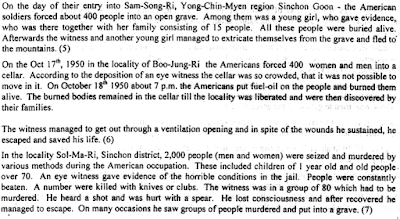 In another case, on October 20th, 2015, 500 men women and children were forced into an air raid cave shelter located in the city of Sinchon. Harrison ordered American soldiers to put explosives into the shelter and seal it with sacks of earth prior to the fuse being lit. Prior to the Korean War, the capital city of North Korea, Pyongyang, had a population of 464,000. As a result of the war, the population had fallen to 181,000 by December 31, 1951. 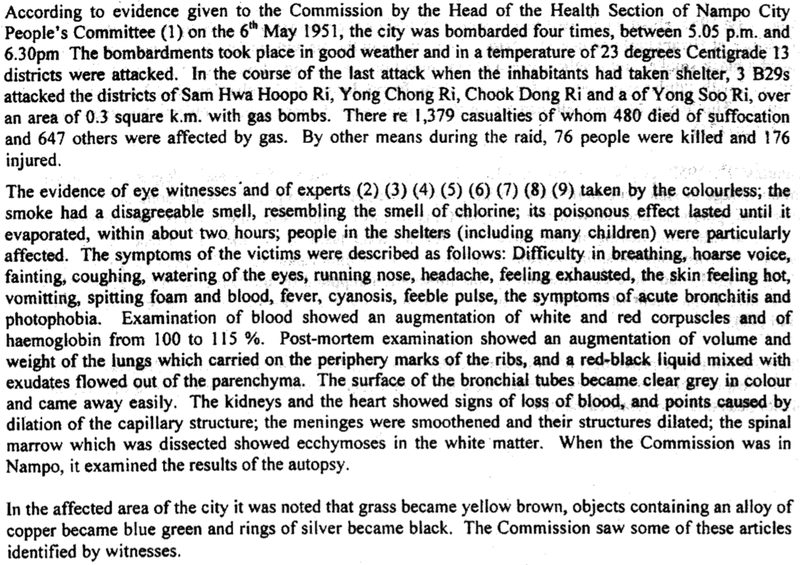 In the period between June 27, 1950 and the Commission’s visit, more than 30,000 incendiary and explosive devices were dropped on the city, destroying 64,000 out of 80,000 houses, 32 hospitals and dispensaries (despite the fact that they were marked with a red cross), 64 churches, 99 schools and university buildings. 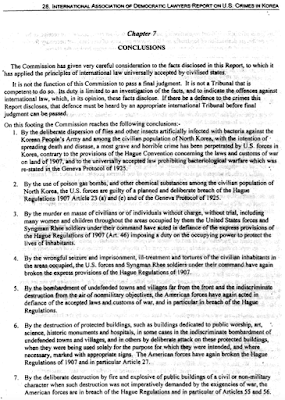 The IADL Commission unanimously found that the United States was guilty of crimes against humanity during the Korean War and that there was a pattern of behaviour which constitutes genocide. 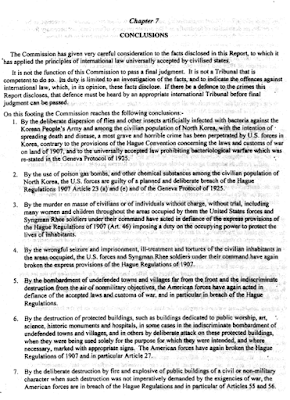 The Members of the International War Crimes Tribunal find the accused Guilty on the basis of the evidence against them: each of the nineteen separate crimes alleged in the Initial Complaint has been established to have been committed beyond a reasonable doubt. 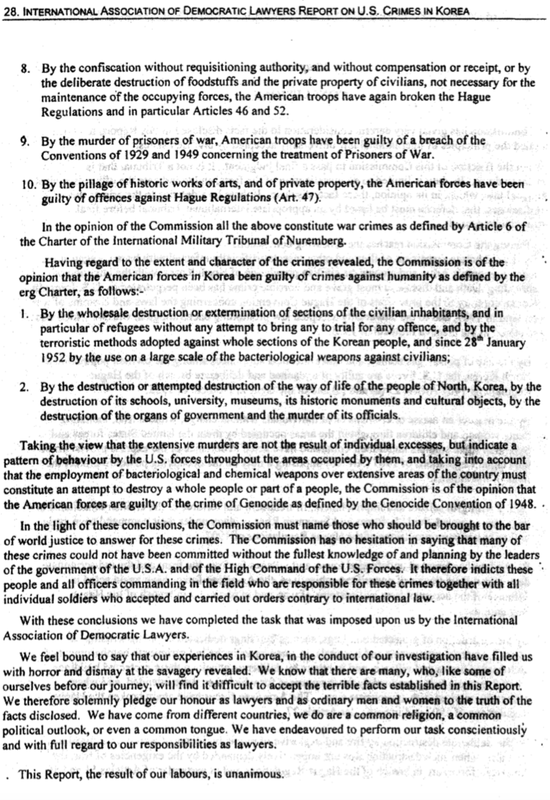 The Members find these crimes to have occurred during three main periods in the U.S. intervention in and occupation of Korea. 1. 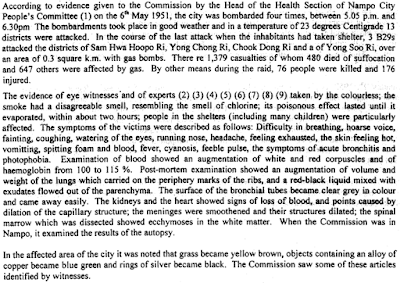 The best-known period is from June 25, 1950, until July 27, 1953, the Korean War, when over 4.6 million Koreans perished, according to conservative Western estimates, including 3 million civilians in the north and 500,000 civilians in the south. 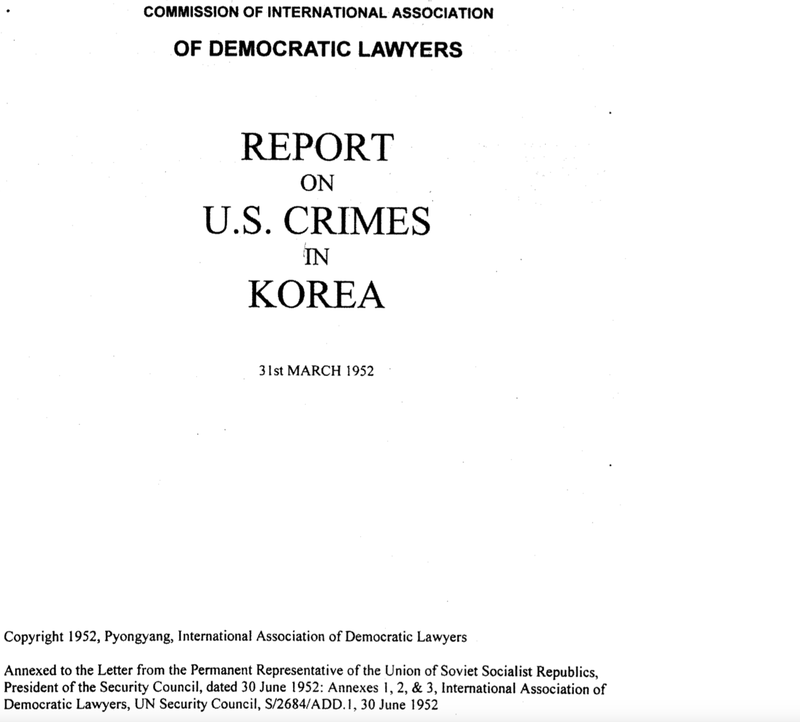 The evidence of U.S. war crimes presented to this Tribunal included eyewitness testimony and documentary accounts of massacres of thousands of civilians in southern Korea by U.S. military forces during the war. 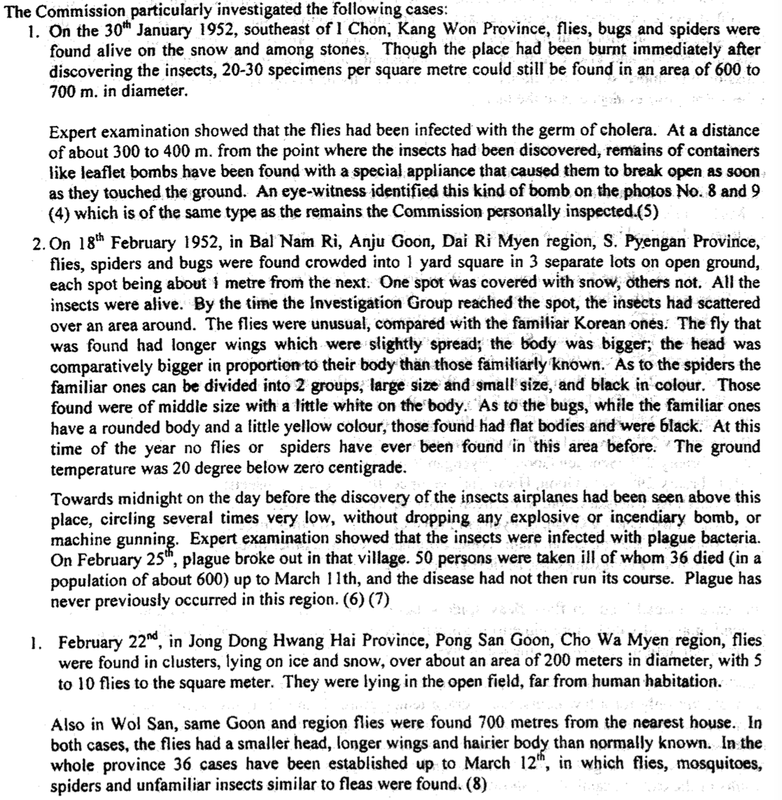 Abundant evidence was also presented concerning criminal and even genocidal U.S. conduct in northern Korea, including the systematic leveling of most buildings and dwellings by U.S. artillery and aerial bombardment; widespread atrocities committed by U.S. and R.O.K. forces against civilians and prisoners of war; the deliberate destruction of facilities essential to civilian life and economic production; and the use of illegal weapons and biological and chemical warfare by the U.S. against the people and the environment of northern Korea. Documentary and eyewitness evidence was also presented showing gross and systematic violence committed against women in northern and southern Korea, characterized by mass rapes, sexual assaults and murders. 2. Less known but of crucial importance in understanding the war period is the preceding five years, from the landing of U.S. troops in Korea on September 8, 1945, to the outbreak of the war. 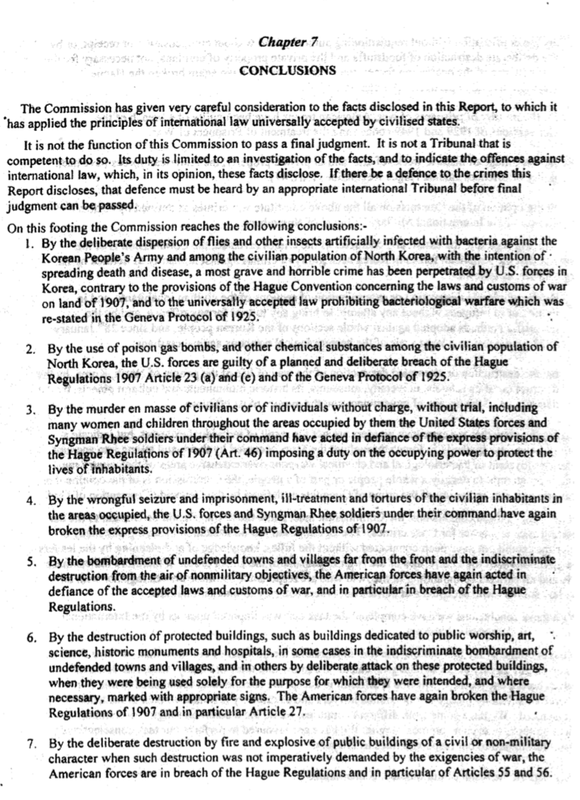 The Members of the Tribunal examined extensive evidence of U.S. crimes against peace and crimes against humanity in this period. 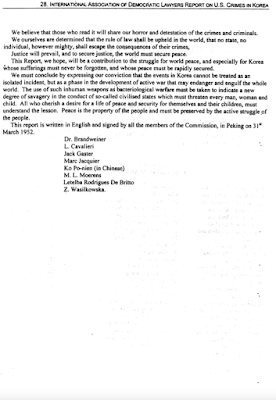 The Members conclude that the U.S. government acted to divide Korea against the will of the vast majority of the people, limit its sovereignty, create a police state in southern Korea using many former collaborators with Japanese rule, and provoke tension and threats between southern and northern Korea, opposing and disrupting any plans for peaceful reunification. 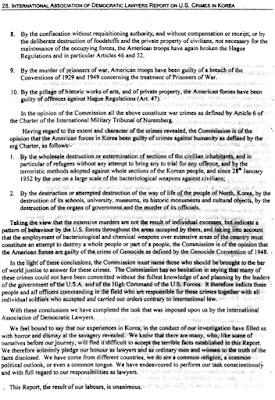 In this period the U.S. trained, directed and supported the ROK in systematic murder, imprisonment, torture, surveillance, harassment and violations of human rights of hundreds of thousands of people, especially of those individuals or groups considered nationalists, leftists, peasants seeking land reform, union organizers and/or those sympathetic to the north. 3. The Members find that in the period from July 1953 to the present, the U.S. has continued to maintain a powerful military force in southern Korea, backed by nuclear weapons, in violation of international law and intended to obstruct the will of the Korean people for reunification. Military occupation has been accompanied by the organized sexual exploitation of Korean women, frequently leading to violence and even murder of women by U.S. soldiers who have felt above the law. U.S.-imposed economic sanctions have impoverished and debilitated the people of northern Korea, leading to a reduction of life expectancy, widespread malnutrition and even starvation in a country that once exported food. 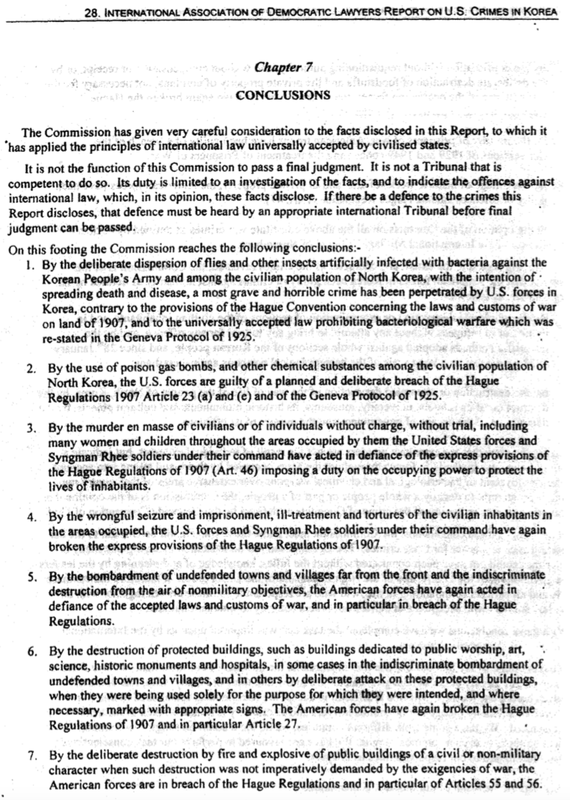 The refusal of the U.S. government to grant visas to a delegation from the Democratic Peoples Republic of Korea who planned to attend this Tribunal only confirms the criminal intent of the defendants to isolate those whom they have abused to prevent them from telling their story to the world. In all these 55 years, the U.S. government has systematically manipulated, controlled, directed, misinformed and restricted press and media coverage to obtain consistent support for its military intervention, occupation and crimes against the people of Korea. 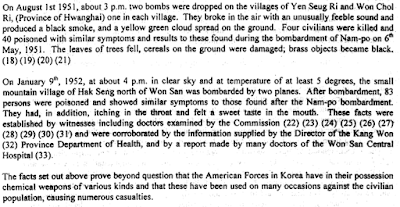 It has also inculcated racist attitudes within the U.S. troops and general population that prepared them to commit and/or accept atrocities and genocidal policies against the Korean people. 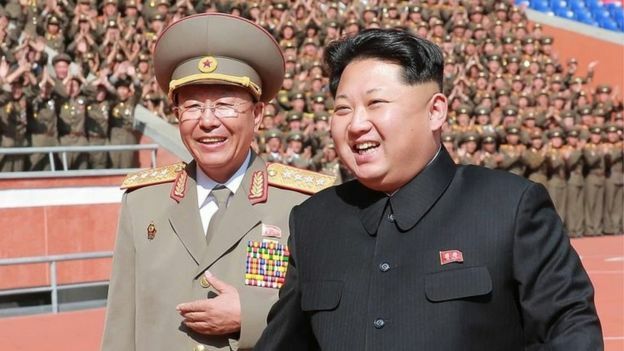 It has violated the Constitution of the United States, the delegation of powers over war and the military, the Bill of Rights, the UN Charter, international law and the laws of the ROK, DPRK, Peoples Republic of China, Japan and many others, in its lawless determination to exercise its will over the Korean peninsula. And Washington wonders why the North Koreans are so hostile toward the United States! The irony of Washington’s criticism of other nations (i.e Syria) and their use of chemical weapons is stunningly hypocritical. Mazda3 GT: attainable status symbol? Jenny Shimizu Got Married – To Cinderella!